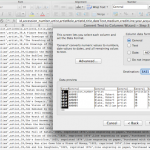 Preface: the files related to my data visualization exploration can be located on my figshare project page: Digital Humanities Praxis 2014: Data Visualization Fileset. In the beginning, I thought I had broken the Internet. 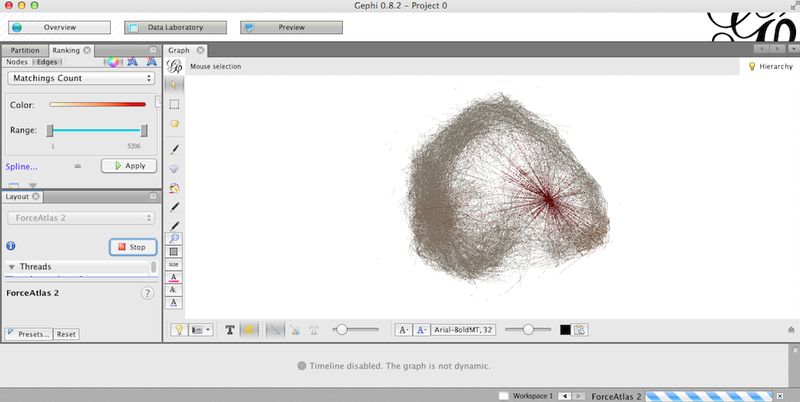 My original file (of all the artists at the Tate Modern) in Gephi did nothing… my computer fan just spun ’round and ’round until I had for force quit and shut down*. Distraught — remember my beautiful data columns from the last post?! — I gave myself some time away from the project to collect my thoughts, and realized that in my haste to visualize some data! I had forgotten the basics. 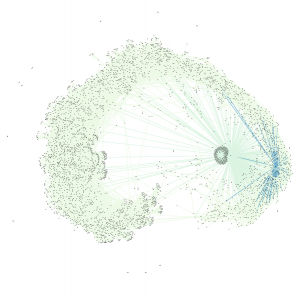 Instead of re-inventing the wheel by creating separate gephi import files for nodes and edges I went to Table2Net and treated the data set as related citations, as I aimed to create a network after all. 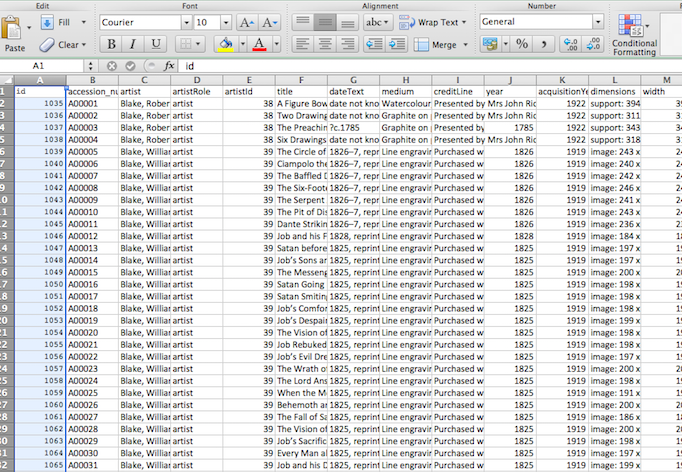 To make sure this would work I created a test file of partial data using only the entries for Joseph Beuys and Claes Oldenberg. I set the uploaded file to have 2 nodes: one for ‘artist’, the other for ‘yearMade’. 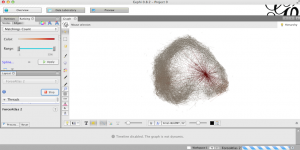 The Table2Map file was then imported into gephi. 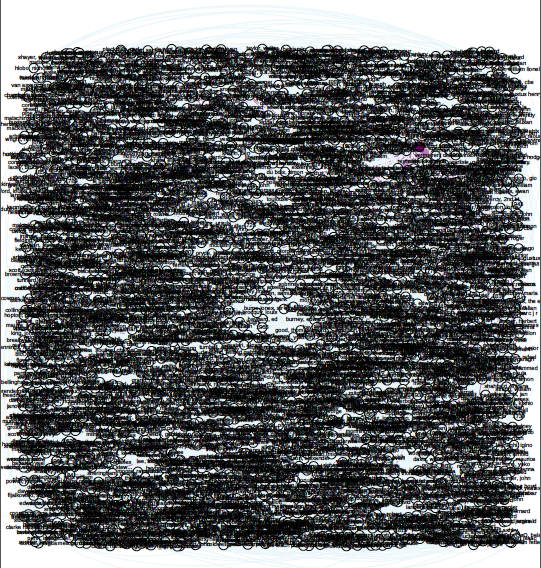 Image 2: the first viz, using a partial data set file; a test. Image 3: OOPS, too much data, but I’m not giving up. 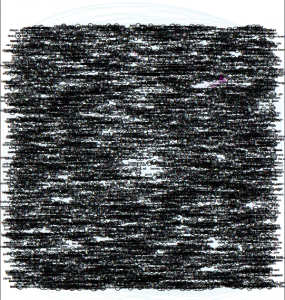 To image 3’s credit, watching the actual PDF load is amazing: it slowly opens (at least on my computer) and layers each part of the network, which eventually end up beneath the mass amounts of labels — artist name AND year — that make up the furry looking square blob pictured here. 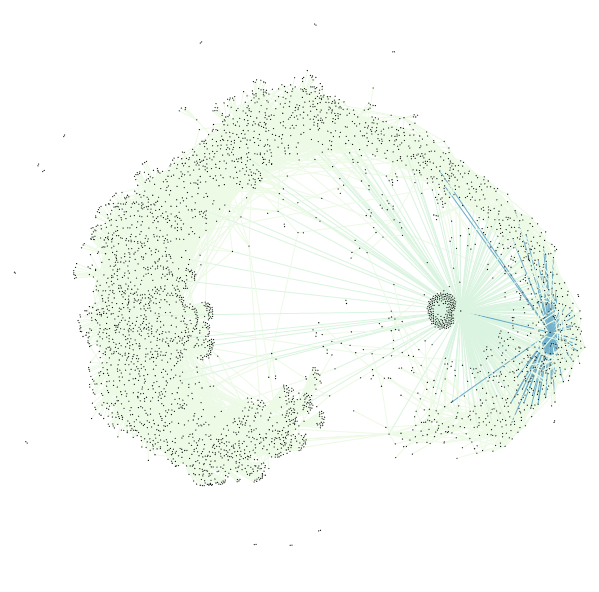 You can see the network layering process yourself by going to the figshare file set and downloading this file. I then knew two things: little data and “BIG” data need to be treated differently. 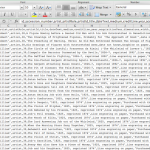 There were approximately 69,000 rows in the “BIG” data set, and only about 600 rows in the little data set. Remember, I weighted the nodes/edges for Image 2 so that thicker lines represent more connections, hence there not being 600 connecting lines shown. Removing labels definitely had to happen next to make the visualization legible, but I wanted to make sure that the data was still representative of its source. To accomplish this, I used the map display ForceAtlas and ran it for about 30 seconds. As time passed, the map became more and more similar to my original small data set visualization — with central zones and connectors. Though this final image varies from the original visualization (image 2), the result (image 1) is more legible about itself. Image 4: Running ForceAtlas on what was originally image 3. My major take-away: it’s super easy to misrepresent data, and documentation is important — to ensure that you can replicate yourself, that others can replicate you, and to ensure that the process isn’t just steps to accomplish a task. The result should be a bonus to the material you’re working with and informative to your audience. I’m not quite sure what I’m saying yet about the Tate Modern. I’ll get there. Until then, take a look at where I started (if you haven’t already). *I really need a new computer. 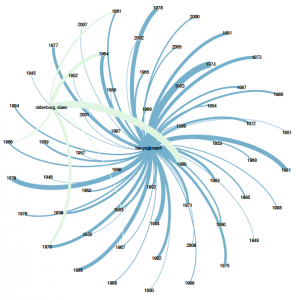 This entry was posted in Fall 2014 and tagged data visualization, figshare, Gephi, GitHub on November 12, 2014 by Kelly Marie Blanchat. It took me a long time to get here, but I’ve found a data set that I feel comfortable manipulating, and it has given me an idea that I’m not entirely comfortable with executing, but am enjoying thinking about & exploring. 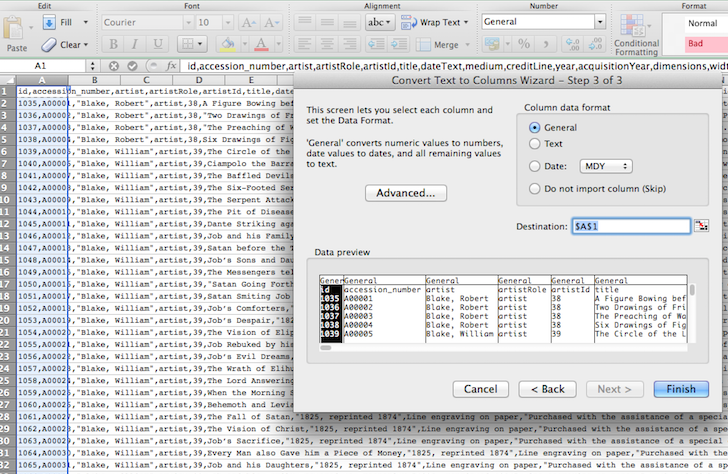 But before I get to that: my data set. I explored for a long time and, if you’ve read my comments, ran into a lot of trouble with RDF files. All the “cool” data I wanted to used was in RDF, and it turns out RDF is my monopoly road block: do not pass go, do not collect $200. 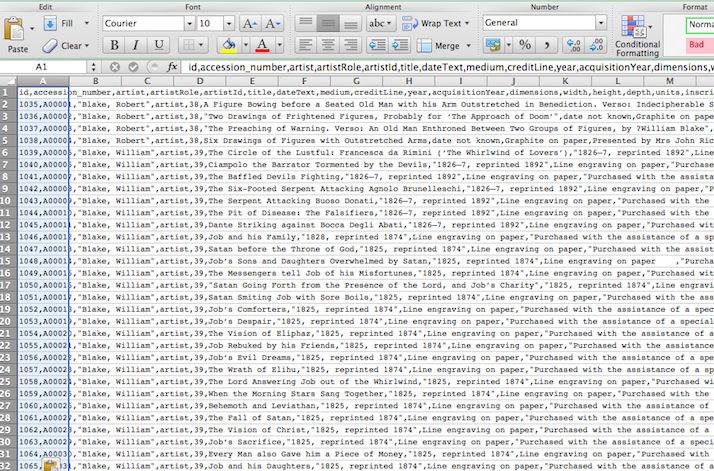 So I kept looking, and eventually found a giant CSV file on Github of the artworks at the Tate Modern, along with another more manageable file of the artist data (name, birth date, death date). But let’s make my computer fan spin and look at that artwork file! It has 69,202 rows and columns that go to “T” (or, 20 columns). 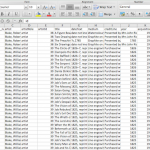 Using ctrl C, ctrl V, and text-to-columns, I was able to browse the data in Excel. But then I started thinking about altmetrics, again — using social media to track new forms of use & citation in (academic) conversations. Backtrack: Last week I took a jaunt to the Metropolitan Museum of Art and did a tourist a favor by taking a picture of her and her friend next to a very large photograph. We were promptly yelled at. 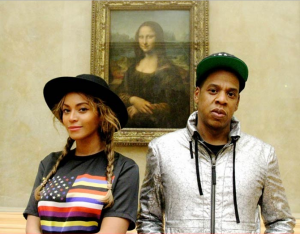 Such a sight is common in modern-day museums, most notably of late with Beyonce and Jay Z. What if there was a way to use art data to connect in-person museum visitors to a portable 1) image of the work and 2) information about the work? Unfortunately, the only way I can think to make this happen would be via QR code, which I hate (for no good reason). But then, do visitors really want to have a link or a saved image? The point behind visiting a museum is the experience, and this idea seems too far removed. What if there was a way to falsify a selfie — to get the in-person experience without being yelled at by men in maroon coats? This would likely take the form of an app, and again, QR codes might need to play a role — as well as a lot of development that I don’t feel quite up for. The visitor is now interacting with the art, and the institution could then collect “used data” to track artwork popularity which could inform future acquisitions or programs. Though this it’s a bit tangential from the data visualization project, this is my slightly uncomfortable idea developed in the process. I’d love thoughts or feedback or someone to tell me to pump the proverbial breaks. I’ll be back in a day or so with something about the visualizations I’ve dreamed up in the bullets above. My home computer really can’t handle Gephi right now. 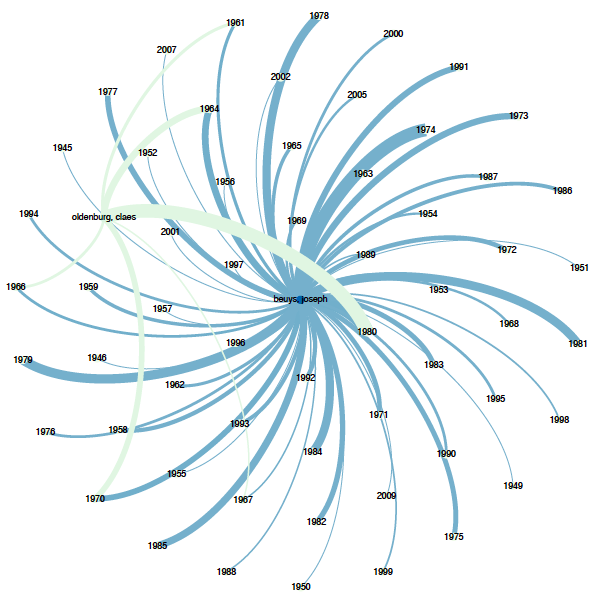 This entry was posted in Fall 2014 and tagged art, Beyonce, CSV, data visualization, GitHub, Jay Z, museum, selfie on November 2, 2014 by Kelly Marie Blanchat.